Bristol City beat fellow strugglers Charlton in front of new manager Lee Johnson to climb out of the Championship relegation zone. 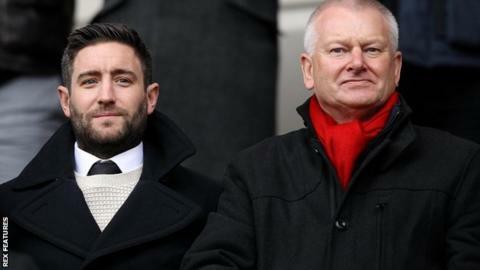 Johnson was appointed Robins boss earlier on Saturday afternoon but watched on from the directors' box. The visitors won it thanks to Lee Tomlin's 21st-minute penalty after the Bournemouth loanee had been pushed by Johann Berg Gudmundsson. The Addicks created openings but never came close to levelling. This defeat, coupled with Bolton's win over Rotherham, means Jose Riga's men have dropped to the foot of the table. Meanwhile, Bristol City have gone up to 20th in the Championship and are now three points clear of the relegation zone. It could have been more comfortable for the visitors but Addicks keeper Stephen Henderson, who perhaps should have kept out Tomlin's spot-kick, made fine saves from two Luke Freeman efforts. Charlton's clearest chance fell to striker Zakarya Bergdich but he shot tamely at keeper Richard O'Donnell. "The main reason we avoided going down last time was my positivity. But I'm also realistic, I'm not a dreamer. "There are lots of games still left to play." "We defended well, limited them to few opportunities and we looked lively on the counter. "It's credit to the players, they are a really good bunch. "The manager coming in has inherited a good group of players, there are some great characters and he has come into a good place." Match ends, Charlton Athletic 0, Bristol City 1. Second Half ends, Charlton Athletic 0, Bristol City 1. El-Hadji Ba (Charlton Athletic) is shown the yellow card for a bad foul. Attempt blocked. Kieran Agard (Bristol City) right footed shot from the left side of the box is blocked. Assisted by Luke Freeman. Foul by Jordan Cousins (Charlton Athletic). Corner, Charlton Athletic. Conceded by Scott Golbourne. Attempt blocked. Johann Berg Gudmundsson (Charlton Athletic) left footed shot from the left side of the box is blocked. Assisted by Simon Makienok with a headed pass. Substitution, Charlton Athletic. El-Hadji Ba replaces Johnnie Jackson. Callum Harriott (Charlton Athletic) wins a free kick in the defensive half. Corner, Bristol City. Conceded by Stephen Henderson. Attempt saved. Luke Freeman (Bristol City) right footed shot from outside the box is saved in the top left corner. Assisted by Aaron Wilbraham. Attempt saved. Luke Freeman (Bristol City) left footed shot from outside the box is saved in the top centre of the goal. Assisted by Kieran Agard with a headed pass. Substitution, Charlton Athletic. Callum Harriott replaces Morgan Fox. Attempt saved. Marlon Pack (Bristol City) right footed shot from long range on the left is saved in the centre of the goal. Assisted by Scott Wagstaff. Attempt saved. Nathan Baker (Bristol City) header from the centre of the box is saved in the top right corner. Assisted by Luke Freeman with a cross. Attempt missed. Luke Freeman (Bristol City) left footed shot from the left side of the box misses to the right. Assisted by Jonathan Kodjia. Offside, Bristol City. Korey Smith tries a through ball, but Jonathan Kodjia is caught offside. Nathan Baker (Bristol City) is shown the yellow card for a bad foul. Attempt blocked. Reza Ghoochannejhad (Charlton Athletic) left footed shot from the left side of the box is blocked. Assisted by Zakarya Bergdich. Simon Makienok (Charlton Athletic) wins a free kick on the left wing. Substitution, Bristol City. Scott Wagstaff replaces Bobby Reid.